Christmas is the feast of Christians belong. However, the celebration of Christmas has become universal. Christmas day can be enlivened by anyone, by the religious premises other than Christian. The new year is the first day in different years. Celebration of the new year is usually celebrated the day before. The celebration was done at night before the hour 12.OO pm. Usually referred to as New Year's Eve. In Bali, Christmas and New Year's celebrations have become part of the life of the Balinese. Although most of the residents of Bali is Hindu religion, but Christmas has become a day that can be enlivened by everyone. Also in the New Year's Eve celebration in Bali. New Year's Eve celebration kemeriahannya similar to the celebration of the new year based on the Balinese calendar. Hindus in Bali actually have a day calculations using different lalender the universal calendar. Balinese people have a calendar system called the wuku. This calendar system also has the new year, the celebrations done by organizing a ritual called the Tawur Kesanga, better known as ogoh- ogoh parade. 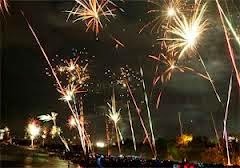 Celebration of New Year's Eve 2015 in Bali will be concentrated in Kuta, precisely on Jalan Legian and Jalan PantaiKuta. Same with the previous year, this year the celebration will be carefully guarded by the police. The government also urged residents not to engage in activities that disrupt public order. Kuta be the center of the celebration of the new year because it is the center of the tourism industry in Bali. Also become routine in order to attract foreign tourists vacationing in Bali, and celebrate New Year's Eve in Bali. Christmas in Bali is also a priority of security by the police. Security in churches and places that made ​​the center of the celebration of Christmas. Police keep all rereja in Bali, even throughout Indonesia, to avoid acts of terror that often occur in areas of conflict outside of Bali. Security is done also to give a sense of calm to the Christians who carry out the celebration of Christmas in a church ceremony.